This was pretty simple to do. I wasn’t completely satisfied with the outline of the fox, I think he looks more like a coyote, but foxes are difficult. The two things I was most pleased with were the music box and the eyes. I had made a trip to the fabric store several weeks before with my long suffering husband. We looked for something in a fox color (rust/reddish/orange) in a soft fleecy material. I finally found a rust colored plaid that was cuddly soft. 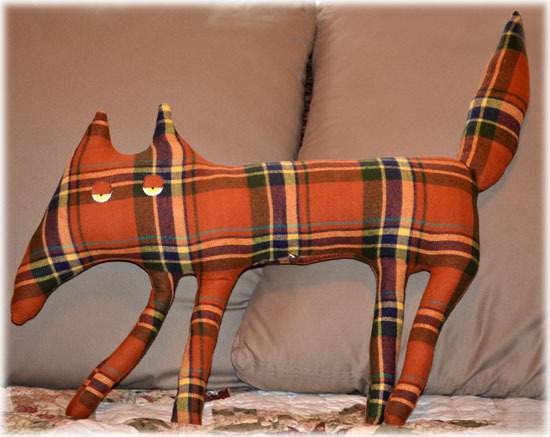 I liked the idea of a plaid fox. Very cool, and completely off the beaten path. I had ordered the music box a month or two before because I had found a place that carries almost any song you can think of. This one is a song that will be very special to my Grandson, as it has his name in the title. How fun is that? Then I proceeded to put the project off, because I was having trouble envisioning how I was going to actually put the music box in without having the hard edges migrate to the top or having the stuffing try to seep out around the hole the key came out of, etc. So, I succumbed to Scarlett O’Hara syndrome. You know, “I’ll think about it tomorrow.” But of course, tomorrow DOES come. And so I had to start if I was to finish before my unborn grandson was off to college and didn’t really care about a stuffed fox that played a song with his name. I started out by drawing a pattern on 4 pieces of large drawing paper I taped together in order to have a big enough piece to use (since I wanted him to be life-size). I had looked at numerous “foxes” online to get ideas for what one should look like, and so I had something in my head. I drew my rough outline, and redrew it several times, fixing it until it looked ok.
Then I cut it out using a rotary cutter. I cut the head narrower than I wanted it (maybe I drew it that way, but it looked worse when I had it cut out) and so I taped some more paper back onto the pattern and recut, making it wider. Finally, satisfied, I made a double thickness of the fabric (making sure I had the correct sides together) and laid the pattern on them. I held my breath and started cutting. Now, I have to stop here and tell you, I had bought WAY more fabric than I thought I needed, because I know me. So, had I completely messed up, I would have been able to make a second one. Still, I don’t like to redo things, and I don’t like to waste. I cut the tail out separately, because it was simply such a large thing. But I’m glad I did. I’m not sure I would like it as well if it were all one piece. I sewed the tail except for the end that fit onto the body up (inside out of course) and turned it right side and then stuffed it. Then the tricky part. I pinned the fox (wrong side out) so that when I started stitching things stayed together as they should. 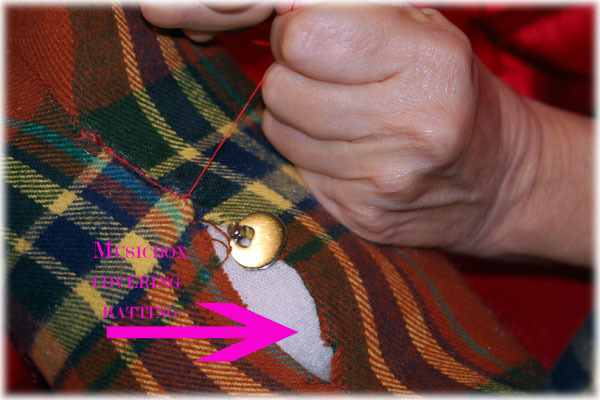 I admit I don’t do this when I’m sewing something small, but big things tend to move around on me. Better safe than sorry. And I started stitching with my sewing machine. I started on his belly and headed up around the front legs, doing the head, ears, back and toward the rear. Then I stuck the tail inside the body, with the unsewn end stuck between the fabric of the fox’s body and stitched the tail into place (so that when I turned him right side the tail would be in place). Then I continued sewing until I came to the belly again. I left a good sized opening, probably 4 inches, so that I could stuff him and put the music box in. It was a little tricky turning around the legs and such, but it came out fine. 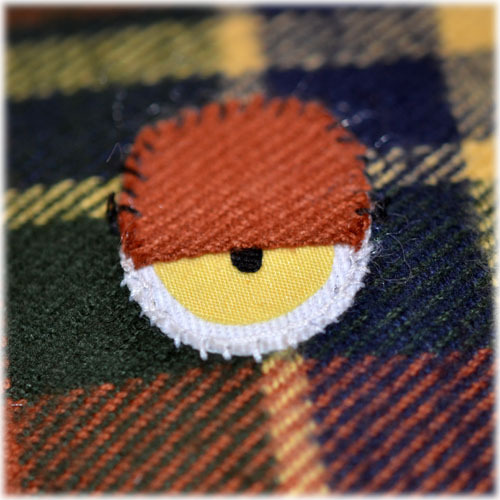 Sometimes I stopped the machine and lifted the foot to turn the fabric a little, put the foot back down and continued on. I back stitched at both the start and finish to be sure it was not going to unravel. I know that the area where the music box is will get a lot of handling. Then I stuffed him using a good quality batting and pushing it into the ears, nose and legs with a chopstick (I do love those to get into those small narrow spaces!). I was concerned about the music box being hard against a baby’s little head, should he lay on his fox as a pillow, so I decided to use an old sock to make a little “bag” to sew the box up in. I cut the top off an old sock, stitched one end up, snipped a little hole in the side, put the music box in, stuck the key through the hole, stuffed batting all the way around very tightly and stitched the other end up. 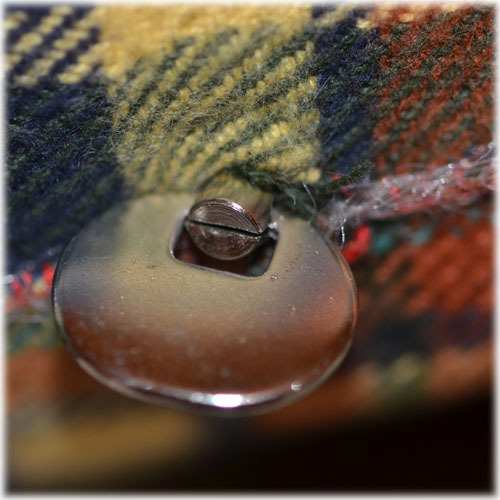 I then stitched up the hole the key was stuck through, just so it wouldn’t get bigger and somehow work it’s way out. Nice and padded! I stuck that into the fox’s belly, added a little more stuffing, stitched him up with the key sticking out. I made sure to stitch as close to the key as I could and to knot the thread on both sides well, as that will get a lot of strain. 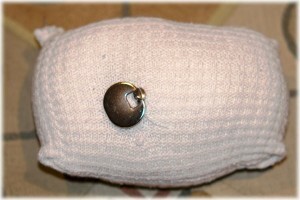 I also think the sock will help keep the music box in place better as it is not slick. You can see the sock in the photo where I’m stitching (that’s what the arrow is pointing to). The last thing I did was his eyes. I didn’t want anything like buttons that would be able to come off and choke a baby. I had initially thought to embroidery some on, but after I had him together I realized it would be difficult to do and make them look uniform and appealing. 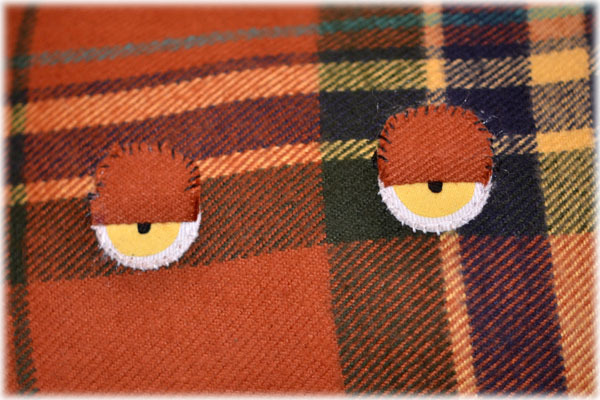 I thought I might be able to buy some applique eyes at the fabric store, but they had nothing, so I ended up making my own from iron on patch fabric. I cut the whites using a quarter as a template, a dime for the yellow part and free handed the black part. Then I ironed them together. I then made an eyelid from the fabric the fox is made of and used the iron on fusible webbing to attach it. Finally I ironed and stitched them onto the fox. More ironing and stitching than I usually do! But I was pleased with the outcome. He has a sleepy eye that I think is kind of sweet. I think for a little girl I could have made girly lips, but since this is for a boy I just didn’t do a mouth at all. Now, if that Grandson will just get here! This is off in the mail tomorrow.